Looking back into nature I observed how clay can become a whole building, as simple as that. Historically bricks have been shaping our cities all over the world, variating in size, colour, production methods & applications yet always present in our urban fabric. Somehow the recently opened Yves Saint Laurent Museum in Marrakesh brought me back to some brick buildings that throughout the years have caught my eye due to their particular use of the modest material: brick. At the beginning a humble brick, just doing its job, yet it has become a tool to create marvellous shapes, volumes & patterns. So I have selected some projects that show the capacities of such simple material when taken to its furthest reaches. For this I have made three categories which appeal greatly to me; curved, perforated & dynamic brick walls & surfaces, that are in fact marvellous on their own & can be found combined like the YSL museum in Marrakesh where Studio KO are showing elements of curved volumes & some straight pattern brick walls that recall the qualities of fabric. Each application has its laying method & personality where curved brick surfaces are crafted to collectively bend the surface made of rigid cuboids in series, almost as giving flexibility to the solid bricks. Equally crafted are the perforated brick walls, where patterns are created to let the light pass trough influencing the baring capacities of the material itself whilst playing with the rhythm of the brick placement. At last but just as detailed or even more, are dynamic brick surfaces that challenge the material & most likely seek to stretch the concept of brick behaviour altogether. From Museum to university campus, from winery/mixed-used building to private homes these selected buildings are wonderful examples of fabulous brickwork. Yves Saint Laurent has a space dedicated to show the great work & fashion achievements of the iconic french Fashion Designer. This project could not take place in any other place, as his love for Marrakech was intense, as he once said: "In Morocco, I realised that the range of colours I use was that of the zelliges, zouacs, djellabas and caftans. The boldness seen since then in my work, I owe to this country, to its forceful harmonies, to its audacious combinations, to the fervour of its creativity. This culture became mine, but I wasn't satisfied with absorbing it; I took, transformed and adapted it." This transformation of material has been somehow expressed by Studio KO on the design of his museum in the way they where inspired by YSL archives. Studio KO were "struck by curves running alongside straight lines; by the succession of delicate & bold forms." Hence the façade of the museum is presented as "an intersection of cubes with a lace-like covering of bricks," shaping patterns that "recall the weft and warp of fabric." YSL museum has throughout various magnificent usages of brick yet the central round courtyard is stupendous! I need to visit soon. Frank Gehry is know for his lively & bold architectural proposals & in this case is not exception. Dr Chau Chak Wing Building in Sydney's Business School was his first building in Australia. Expectations where high & even though he has been critiqued for apparently giving priority to the styling of the building over its functionality, I believe is Architects like him that discover the next step forward by risking. Dr Chau Chak Wing Building in the campus of the University of Technology in Sydney has been designed inspired on a "treehouse", with the intention to grow where the external shape was a consequence of the intricate internal layout, described by Gehry as "a growing learning organism with many branches of thought, some robust and some ephemeral and delicate". The brick envelop is very unique & rather stimulating as it appears as a large wavy façade caught in a frozen picture frame through movement. Over 300000 bricks where customised to achieve this building structure & was all hand laid therefore deserves credit for the achieved result. 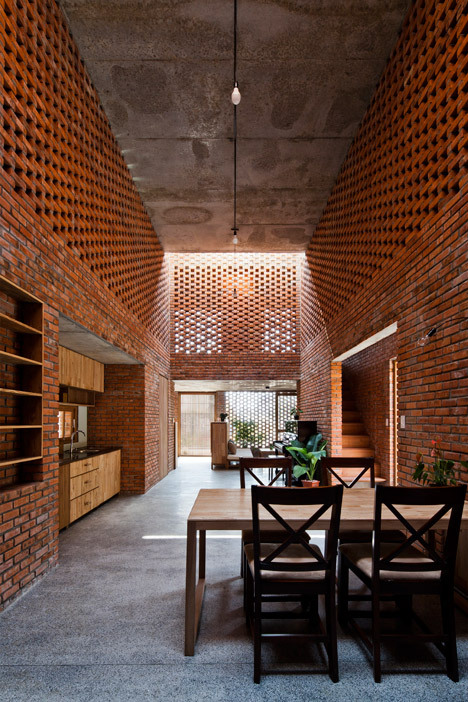 Perforated brick walls take over the original existing concrete structure of an old house to achieve a fantastic refurbishment by Architectural Studio Tropical Space in Vietnam. A design meaningful design; like the orange-red bricks that refer to the 15th century towers of Champa Kingdom & an internal layout that protects the living area in the centre of the house alike the chambers of termite nests. Hence the projects name. "The special design of the baked-brick walls with a lot of holes, together with the large inter-floor space, allows breeze and light to get to all the corners of the house, even the hardest-to-access areas," explained the architects. Becoming then ideal to deal with the extreme variations of climate in Vietnam. The variation on the density of perforation of the walls determines the amount of privacy too. Artificial light shines through the brickwork of both facades at night time, & during the day natural light shines through. "In the evening & at night, the house looks like a giant lantern with lights here and there from the holes," said the architects. This compact project has embrace the usage of perforated brickwork as every aspect as climate, ventilation, lighting & distribution have been consciously considered. Interior view from the dinning of The Termitary House refurbishment by Architectural Studio Tropical Space in Vietnam as seen in www.dezeen.com/ Photo credit: Oki Hiroyuki. Front view of The Termitary House refurbishment by Architectural Studio Tropical Space in Vietnam as seen online. Stairway of The Termitary House refurbishment by Architectural Studio Tropical Space in Vietnam as seen in www.dezeen.com/ Photo credit: Oki Hiroyuki. Arquitetos Assosiados in Brazil have created this private home where back & front façades have a degrade perforated brick walls in a light colour brick. This generous property was seeking privacy yet still enjoy of an internal open layout with large air volumes, which was essential for the designing of this home. KS Residence project complies with all parameters that regulate construction in the area but have been taken to the extreme to create 3 floors with character of their own; the semi-buried underground garage & atelier, the ground level which appear floating form the ground for the social & living areas, & the upper floor for the private space like bedrooms. These logic has dictate the space design & as a consequence also the aesthetics of this home. I appreciate greatly the result of putting user' desires+construction regulations taken to the extreme+climatological functionality= a gorgeous almost freestanding semi perforated brick box with generous spacial qualities, where again the density of the brick saturation increases due to privacy. An exciting residential project that is fully functional. This project in Mexico City is to die for, perhaps my favourite in this selection! Each corner of the buildable area is definitely used to lay bricks, it stands literally like a clay tower extruding from the ground. However as this is erected by very thin layers of bricks this clay box appears light & almost fragile. 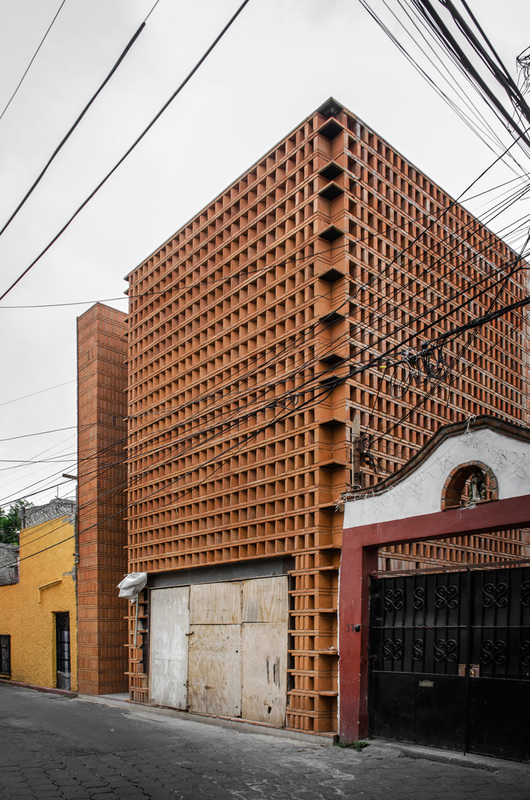 Taller Mauricio Rocha + Gabriela Carrillo has design a wonderful studio in only a plot of 7x14 meters where 3 floors take place within this clay wrap. The thin brick is creating textures according with the direction & density f the brick pattern, how ever due to earthquake tendencies the building also has perfectly stressed of steel to hold it all in place. Inside the layout is rather simple as the building sits in the middle of the building & behind the front & back façades hide away two fabulous inner courtyards wrapped by this brick game. Looking out the wooden window a unique texture bringing silence in the hectic city. Design purpose to caused the silence & consciously extreme use of material as strategically key to the building. The most impeccable use of bricks that gently come apart for a slight view to the outside. Internal view into the courtyard of Estudio Iturbide by Taller Mauricio Rocha + Gabriela Carrillo in Mexico City as seen in www.blogfundamentos.com/ Photo credit: Oscar Hernandez. Façade of Estudio Iturbide by Taller Mauricio Rocha + Gabriela Carrillo in Mexico City as seen in www.blogfundamentos.com/ Photo credit: Oscar Hernandez. MUKA Arquitectos have designed a sweet purposeful project in Ciudad Real, Spain. Casa Piedrabuena is a private house that has some peculiarities; a street access a little wider than two meters that after a long corridor it opens up onto a wider, more generous living space which is totally oriented toward the brick entrance. The plot is totally surrounded by neighbouring walls except from that narrow entrance. Modest project that proposes a commonly used local material, which seems rather familiar to the eye, to emphasising the proportions of the façade. A ceramic veil regulates the light coming through & controls spacial ventilation. In those warmer days the porous ceramic brick screen has also the aim to create great thermal comfort by using a bioclimatic system that wet the ceramic bricks to cool the air by simple evaporation. Casa Piedrabuena is without a doubt a great example of a dynamic design; in questions of the thinking process & consequent design as much as those pivoting panels of ceramic lace. Tehran is growing at a great speed, therefore Iranian typical lifestyle is replaced by more modern development that are vertical & with compact interiors. Privacy is essential so this imitates the more traditional architecture used in private garden courtyards where windows are rarely naked to the eye. Admun Design has proposed a dynamic veil over the now exposed window front façade of this residential development. In parallel there have been other challenges; for instants the original structure was build by another team which added to the strict regulations in Tehran. Nothing could defeat their intend to achieve privacy, moderated light, private balconies yet to control also the noise in such hectic city. Behind these balconies a possible space for plants take place, becoming then a part of that environmental filter. As a result a covering screen with regulable brick has been cladded to the original structure whilst creating a beautiful fabric. Daylight & privacy control are possible due to the rotating bricks screen that was designed by a software which made easier the execution. The effect caused by it is definitely worth to look at. Which has been your preferred brick building today & which are those that should be part of this selection. Let me know in the comment section below, I will speak to you on the next blog post!